Q: Is Gift Wrapping offered on all products? A: Gift wrapping options are offered on most products. If gift wrapping is available on a given item, you will see that option on the product description page. Some items are shipped directly from our Print or Embroidery studios and cannot be gift-wrapped. Q: Why do you offer FREE Gift Wrapping? A: In addition to offering this service as a convenience of time and money for our customers, we are glad to go that extra mile to make sure your gifts give a wonderful first impression. This reflects positively on both you and us. Q: What are your Gift Wrapping Options? A: We offer two options for gift wrapping. FREE GIFT WRAPPING: Depending on the shape/size of the item, we may place it in a box and wrap it with one of our many, high quality wrapping papers, or we may wrap it a piece of tissue paper and place it in a gift bag. 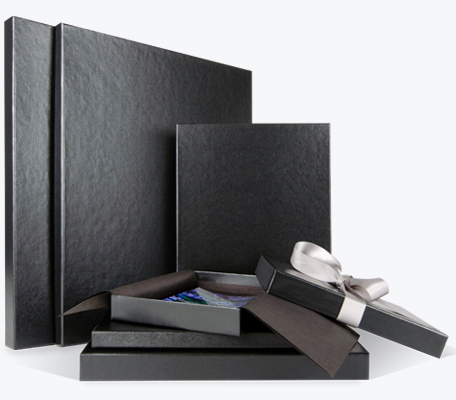 BOUTIQUE PACKAGING: This option is available for Icon Formats only and includes boutique black boxes, with black tissue paper and silver satin bows. This is a premium option available on only those items where offered, for an additional fee as listed. Q: How do I select a Gift Wrapping Option? A: Click the link to View Cart on the upper lefthand corner of your screen. There you will see the available options for all of the eligible items in your cart. Q: Will selecting Gift Wrapping delay my order? A: We do ask that you allow an extra day for gift wrapped orders to be processed. But, as with all of our orders, we try to ship as soon as possible.